Roast Chicken and rosemary roast veg. Only two more weeks left of winter - I'm soooo excited! Spring is on its way, but as usual Melbourne has decided to throw some truly wintery weather at us and finish off the season in style. So I've decided to pull out my last couple of hearty winter dishes for the year. This week I'm going back to a classic. 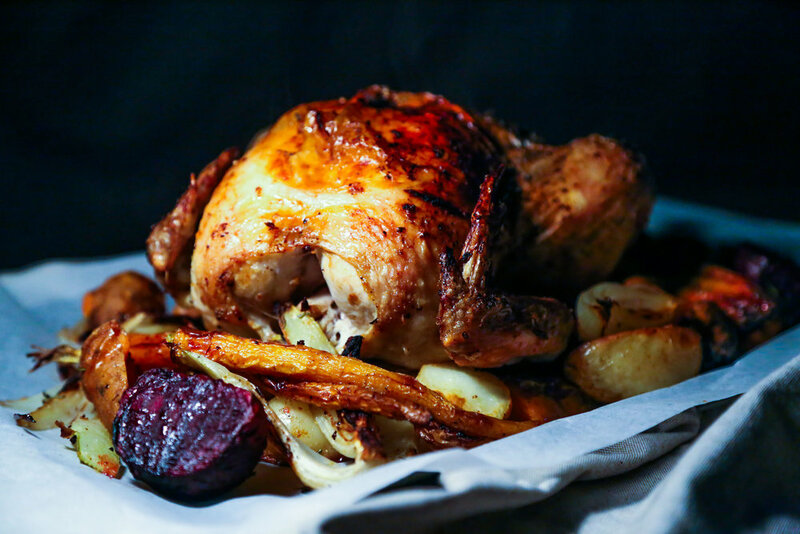 Good old roast chicken with a hearty side of rosemary roasted root veg. I remember my grandmother making roast chicken for Sunday dinner when I was about 5 years old - before our family became vegetarian. There's something so comforting and cosy about a good roast dinner. I'm a sucker for a slow roast lamb shoulder or pork belly with all the trimmings, but it takes so much effort and usually feeds a crowd. This meal is the perfect compromise for when you are time poor or only have a few mouths to feed but still want to enjoy a delicious roast. I love using a wide variety of veggies - I especially love the charred shallots and fennel in this recipe. Don't be too fussed about what veggies you use though. Just try and cut everything a similar size and it will cook evenly. Chop veggies into large chunks. Place in a bowl and cover with oil and seasoning. Toss well to coat evenly. Line a large roasting tray with baking paper. Spread veggies over the tray in a single layer leaving a space in the centre for the chicken. To save on dishes place chicken in the same bowl you just used for the veg. Drizzle over the olive oil plus salt, garlic powder and lemon zest. Using your hands rub the oil and salt mix really well all over the chook. Stuff the halved lemon inside the chook along with any remaining sprigs of rosemary. Place in the centre of the veggies. Whack the tray in the oven for 40 - 50 minutes at 180'C until all the veg is golden and the chicken skin is crispy. Remove from the oven and serve straight to the table with a side of steamed greens or a lovely leafy salad. The best gluten free all occasion cake with Chocolate, coffee and almond.